Rock Werchter 2010: The Official Application. If you’re going to do something, go big or go home. That seems to be the theme behind everything happening at Rock Werchter 2010 this year. The annual music festival will be held July 1st through 4th, alongside the Haachtsesteenweg in Werchter (about 30 km from Brussels). Rock Werchter has been called the world’s best music festival for several years, and its extra touches like having its own location-based application that keep it going over the top year after year. Over-the-air synchronization will keep your application up to date with the latest news, announcements and happenings through the festival. To top that off, the data is stored locally so you won’t have to worry about being out of touch when you’re out of coverage. If you’re not sure what time something is happening, the schedule will show you who is going to be where and when. And in case you’ve lost track of time, there’s a dashed line in the schedule to show you what time it is and give you a point of reference. When you have a lineup of nearly 50 artists, it’s entirely possible that you’re not going to know about some of them. So while you’re discovering their sound, you can also learn more about the artist from the Profile Page. Pretty amazing idea, to say the least. Find an artist that you’re really liking? Tap the heart in the corner of the profile and they will be added to your personal favorites list, for easy reference. Now what would a location-based app be, if it didn’t have points of interest? You’ll want to check out the points for drink stands, catering and the like, but you can also create your own. So make sure you tap the shield for your tent, your car or other areas you want to remember, then you’ll be able to easily find them again. 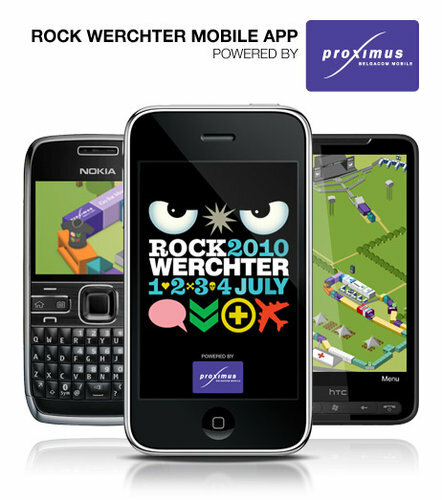 The Rock Werchter mobile application powered by Proximus will be available for download through the festival website (www.rockwerchter.be) or the Belgacom Skynet portal (www.skynet.be). Iphone and Android users can download the Rock Werchter mobile application powered by Proximus direcly to their phone via the newly launched Skynet mobile portal (m.skynet.be). Users in Belgium with another phone can get the application by sending a free SMS with the keyword ‘Werchter’ to the number 8130 (NL) and 8140 (FR). Want more information about Rock Werchter 2010? Hit up the official website for more information than you could possibly ever need. Read next: Ok, Who Hacked Google Trends This Time?